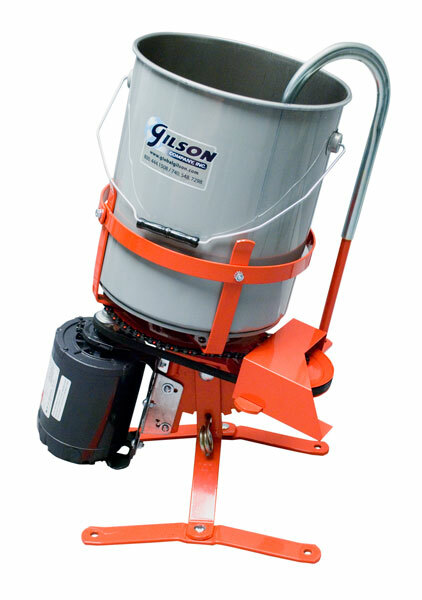 Light-Duty Stationary Mixer - MA-66 - Gilson Co. The MA-66 Light-Duty Stationary Mixer is a belt-drive unit best suited for mixing 5gal (19L) batches of materials not exceeding 70lb (32kg). As the bucket rotates at 60rpm, a Stationary Mixing Paddle scrapes the sides and bottom of the bucket to ensure thorough mixing. A removable 5gal Utility Bucket and Standard Mixing Paddle are included. A Deluxe Mixing Paddle with extra fins is available for heavier loads. All 115V/60Hz mixers are supplied with a 1/2hp motor, On/Off switch, fuse protection, and an 8ft cord with three-prong plug.